The statement of cash flows, also called the cash flow statement, is the fourth general-purpose financial statement and summarizes how changes in balance sheet accounts affect the cash account during the accounting period. It also reconciles beginning and ending cash and cash equivalents account balances. This statement shows investors and creditors what transactions affected the cash accounts and how effectively and efficiently a company can use its cash to finance its operations and expansions. This is particularly important because investors want to know the company is financially sound while creditors want to know the company is liquid enough to pay its bills as they come due. In other words, does the company have good cash flow? The term cash flow generally refers to a company’s ability to collect and maintain adequate amounts of cash to pay its upcoming bills. In other words, a company with good cash flow can collect enough cash to pay for its operations and fund its debt service without making late payments. The cash flow statement format is divided into three main sections: cash flows from operating activities, investing activities, and financing activities. Cash flows from operating activities include transactions from the operations of the business. In other words, the operating section represent the cash collected from the primary revenue generating activities of the business like sales and service income. Operating activities are short-term and only affect the current period. For example, payment of supplies is an operating activity because it relates to the company operations and is expected to be used in the current period. Operating cash flows are calculated by adjusting net income by the changes in current asset and liability accounts. Cash flows from investing activities consist of cash inflows and outflows from sales and purchases of long-term assets. In other words, the investing section of the statement represents the cash that the company either collected from the sale of a long-term asset or the amount of money spent on purchasing a new long-term asset. You can think of this section as the company investing in itself. The investments are long-term in nature and expected to last more than one accounting period. Investing cash flows are calculated by adding up the changes in long-term asset accounts. Cash flows from financing consists of cash transactions that affect the long-term liabilities and equity accounts. In other words, the financing section on the statement represents the amount of cash collected from issuing stock or taking out loans and the amount of cash disbursed to pay dividends and long-term debt. You can think of financing activities as the ways a company finances its operations either through long-term debt or equity financing. Financing cash flows are calculated by adding up the changes in all the long-term liability and equity accounts. Here is a tip on how I keep track of what transactions go in each cash flow section. Operating Activities: includes all activities that are reported on the income statement under operating income or expenses. Investing Activities: includes all cash transactions used to buy or sell long-term assets. Think of these as the company investing in itself. Financing Activities: includes all cash transactions that affect long-term liabilities and equity. Whenever long-term debt or equity is involved, it is considered a financing activity. Here is the statement of cash flows example from our unadjusted trial balance and financial statements used in the accounting cycle examples for Paul’s Guitar Shop. The statement of cash flows is generally prepared using two different methods: the direct method and the indirect method. Both result in the same financial statement showing how financial transacations affected would have affected the bank account of the company. Each method is used for a slightly different reason and typically used for different sized companies. Let’s take a look at how to create a statement using both the direct and the indirect methods in the next aritcles. 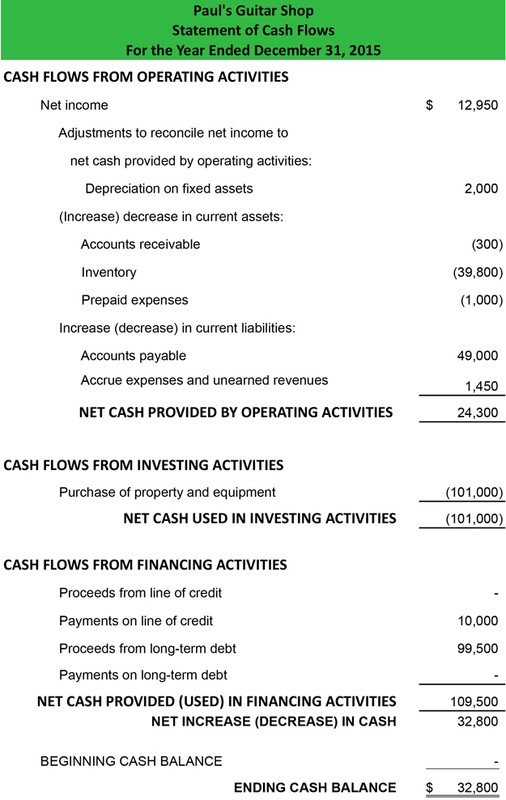 1 What is the Cash Flow Statement?